Change your skin. Nothing works like this amazing firming, toning water. Your skin will become so beautiful, you won't want to wear makeup. It is important to use it correctly. Promotes healthy skin, rejuvenates the appearance of fine lines and wrinkles. Helps maintain integrity of the connective tissue of the blood vessels. Capture Youth Water will change your skin for the better. All natural, Pure Spring Water. Natural Trace Elements. NRGized, Our unique process is nothing like you find anywhere else. 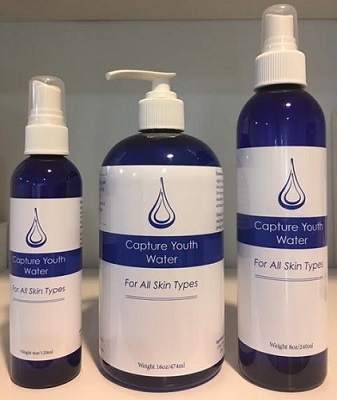 Capture Youth Water products described on this website are intended to meet the FDA's definition of a cosmetic product, an article applied to the human body to cleanse, beautify, promote attractiveness, and alter appearances. These products are not intended to be drug products that diagnose, treat, cure, heal, or prevent any disease or condition. Products are for topical use only and should be kept out of the reach of children. If irritation develops discontinue use.